The need for the United States to adopt space-based sustainable energy—for example, space solar power—as its primary energy source to replace fossil fuels is now clear. This means that discussions of space-based energy have moved beyond a focus on cost comparisons with traditional terrestrial fossil fuel and renewable energy sources. These discussions have turned to determining how to proceed with establishing the immense new commercial space sustainable energy industry and enabling spacefaring logistics infrastructure America now needs this century to become environmentally and sustainably energy secure. The purpose of this three-part series is to explain to the American aerospace community why, just as American-led aviation transformed the nation last century, becoming a true commercial human spacefaring nation this century will again transform America. I argue that the primary decision drivers for building space-based sustainable energy systems will be the environmental and energy security threats the United States now face, due to its substantial dependency on fossil fuels and the lack of any satisfactory terrestrial non-fossil fuel energy alternatives. The primary decision drivers for building space-based sustainable energy systems will be the environmental and energy security threats the United States now face, due to its substantial dependency on fossil fuels and the lack of any satisfactory terrestrial non-fossil fuel energy alternatives. This first article addresses the reasons for the environmental security threat and introduces the need for space-based sustainable energy to resolve this threat. The second part will discuss the energy security threat, due to rapidly declining US fossil fuel resources, to explain why America must transition this century to non-fossil fuel energy sources. The final article will quantitatively evaluate the US terrestrial nuclear and renewable energy alternatives to replace fossil fuels and explains why none of these are sufficient to meet US energy needs in 2100. It concludes with a description of what will be needed from space solar power to achieve US environmental and sustainable energy security this century. Humans the world over have generally adopted an ethical responsibility to address our civilization’s impact on the Earth’s environment, both locally and globally. While the negative impacts of industrial and agricultural operations on the local environment have been long recognized, about three generations ago we came to understand that humans were creating negative global environmental impacts. One example was the reduction of the atmosphere’s ozone layer, caused by the release of some industrial chemicals into the atmosphere. With ozone being critical to stopping harmful ultraviolet radiation from the Sun, nations reached consensus on needed actions to address this perceived threat. They invented and adopted replacement chemicals and processes with no or far less environmental impact were. Of particular importance in this global effort was that our standard of living—e.g., refrigeration and air conditioning—was not sacrificed in pursuit of viable solutions. Instead, improved technologies were adopted to resolve this threat. Also of note, these actions were undertaken before any direct evidence of harm was available. In short, action was taken based on the uncertainty that harm could already be occurring. Over the past generation, a similar concern has risen about the environmental impact of abnormally high and rising levels of atmospheric carbon dioxide, a greenhouse gas. By analyzing trapped air bubbles in buried ice up to 400,000 years old, scientists found that the level of atmospheric carbon dioxide varies as a function of the Earth being in a glacial period, when northern glaciers are prominent, or an interglacial period when these glaciers recede. During glacial periods, as the climate cools, the carbon dioxide concentration falls to about 180 parts per million (ppm). During the warmer interglacial period, such as now exists, it normally climbs to about 280 ppm. 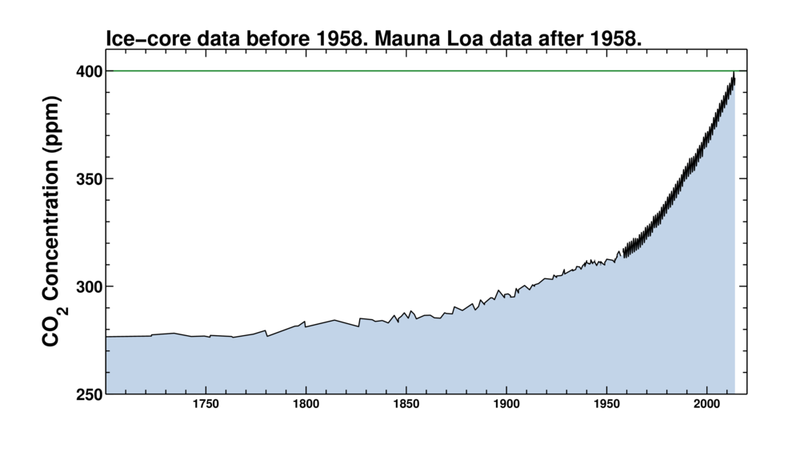 Current carbon dioxide levels are now climbing above 400 ppm. Prior to the mid-1700s, the carbon dioxide level was about 275 ppm. As the world’s population climbed above one billion people, the carbon dioxide concentration began to rise even before there was any significant use of fossil fuels. One may reasonably conclude that human population size, enabled by our civilization (e.g., farming, animal domestication, forest clearing for agriculture and pasture, and fossil fuel use), is the cause of the current abnormally high and increasing carbon dioxide levels. In effect, humans, by virtue of our growing numbers and increasing standard of living, appear to be changing the Earth’s environment in a way for which the consequences are unknown and, potentially, harmful—in other words, creating uncertainty and reasonable concern. While developed nations are to immediately curb fossil fuel carbon dioxide emissions, developing nations are to try to reach their peak sometime in the future and then “undertake rapid reductions” sometime later. In eons past, carbon dioxide levels were likely much higher. During the time of the dinosaurs, the level is believed to have exceeded 2,000 ppm. From this, we know that higher life forms and fauna can exist for long periods of time under these conditions. That was, however, hundreds of millions of years ago. In the last 400,000 years, as the Earth has undergone cycles of climate change—global cooling during glacial periods and global warming during interglacial periods—the range has been 180–280 ppm. This implies that a new environmental balance exists producing a climate that, during this interglacial period, enabled human civilization to flourish. Obviously, it is in our best interests to not disturb these favorable circumstances. Thus, the uncertainty from the impact of the abnormally high carbon dioxide levels on human civilization constitutes an environmental security threat that, ethically, we must address. Greenhouse gases, in order of most abundant to least abundant, are: water vapor, CO2, methane, nitrous oxide, (interestingly) ozone, and chlorofluorocarbons. Clearly, the Earth’s climate change causing natural global warming and cooling is not the treaty’s focus. The treaty is meant to address the potentially harmful modifications to the environment that human civilization brings about. Thus, a more precise phrase to use, to avoid confusion, is harmful anthropogenic modifications to the climate system or environment instead of using the confusing phrases “climate change” or “global warming”. Despite this treaty’s reasonable and ethical foundation of concern regarding harmful anthropogenic modifications to the climate system, attempts to implement the treaty have floundered in two ways. The first misstep was to select increases in the global average air temperature—often referred to as “global warming”—as the measure of merit for judging the effectiveness of the treaty’s implementation measures. While atmospheric carbon dioxide levels have been steadily rising, the calculated global average air temperature has not. There have been prolonged periods with very little average temperature increase indicating a lack of direct correlation. Further, the reliance on predictive temperature models has become highly contentious, as many failed to predict the most recent decade-long pause in temperature increases. Without correlation and predictability, temperature change is a poor measurement for assessing the effectiveness of the treaty’s implementation measures. While developed nations are to immediately curb fossil fuel carbon dioxide emissions, developing nations are to try to reach their peak sometime in the future and then “undertake rapid reductions” sometime later, with the implication being by the end of the century. Further, priority appears to be given to the eradication of poverty rather than the stated “urgency” of curbing potentially harmful carbon dioxide emissions. These conflicting implementation priorities raise justifiable questions as to the effectiveness of the Paris Agreement. It does not appear to be focused on the treaty’s primary environmental protection reason of preventing “dangerous anthropogenic interference with the climate system” but on other social-political goals. Setting aside the Paris Agreement, we need to return our attention to the key environmental issue: the uncertainty in what level of abnormally high greenhouse gas concentrations (e.g., carbon dioxide) will initiate “dangerous anthropogenic interference with the climate system.” I argue that this uncertainty is what constitutes the environmental security threat that ethically we must address. The question then becomes how to deal with this threat while also enabling “economic development to proceed in a sustainable manner.” The starting point is to understand how these two goals are linked in order to define a path forward that will successfully address both. Throughout much of human history, the source of the energy was the food for humans and domesticated animals. The key technology advancements were plant and animal domestication, irrigation, permanent shelter, and food storage. Together, these enabled human civilizations to prosper and grow across thousands of years. Beginning in the Middle Ages, the energy source shifted to mechanical power. First, waterpower replaced human and animal work and, then, steam power replaced waterpower beginning in the 1700s. This ushered in the Industrial Revolution, largely fueled by fossil fuels. This natural human desire to improve our standard of living continues today, especially in developing nations wishing to catch up. When all factors are considered, the appropriate path forward is for human civilization to become spacefaring and pursue space-based sustainable energy—e.g., geostationary Earth orbit-based space solar power—as the world’s primary carbon-free energy supply. Acknowledging the need to promote universal access to sustainable energy in developing countries, in particular in Africa, through the enhanced deployment of renewable energy. The treaty parties’ search for a solution to this conflicting dilemma of competing needs has led to a failure to identify an effective implementation approach. These political leaders see themselves as part of a planetary civilization instead of as an emerging spacefaring civilization. Throughout the history of human civilization, settled humans have come to realize that the growing needs of their culture could not be met within their existing boundaries. They undertook exploration, trade, and settlement to obtain their needed resources. Eventually, many realized that not all needed resources could be obtained by land and they went to sea—becoming seafaring—to meet their needs. In short, they moved beyond perceived boundaries, often by adopting new technologies, to find success. The world clearly needs a source of sustainable energy sufficient—roughly 70,000 gigawatts of electrical power by 2100—to maintain the standard of living in developed nations and to enable developing nations to achieve a comparable standard of living. Further, the world needs to transition away from fossil fuels in order to ethically respond to the environmental security threat posed by the uncertainty of abnormally high levels of carbon dioxide. When all factors are considered, the appropriate path forward is for human civilization to become spacefaring and pursue space-based sustainable energy—e.g., geostationary Earth orbit-based space solar power—as the world’s primary carbon-free energy supply. Consistent with the “urgent” time line discussed in the Paris Agreement, the goal should be to achieve this transition by the end of this century. With this understanding of what is needed to transition from fossil fuels, a final question arises about what to do about the abnormally high levels of carbon dioxide that will remain in the atmosphere when the use of fossil fuels ends. One choice is to wait to see if anything bad happens. The more responsible choice is to undertake the implicit treaty objective to remove any anthropogenic environmental threat by returning the carbon dioxide levels to that of pre-industrial times. The safe bet will be to capture this excess carbon from the atmosphere and return it to geological storage in the form of synthetic methane or oil. Essentially, this would refill the world’s depleted natural gas and oil fields. We have the technology to do this. It will also provide an emergency energy supply, distributed globally, should the need for this arise in the future. In all likelihood, such an undertaking will likely extend well into the 22nd century. This final step will require an excess of carbon-free sustainable energy to power the carbon dioxide converters. Consequently, the capacity of the space-based energy systems must be expanded to supply needed excess energy. With this added measure, the two primary objectives of the 1992 UNFCCC treaty will be accomplished by transitioning to space-based sustainable energy: the world’s population will have access to the sustainable energy needed to raise the standard of living and eradicate poverty and the excess carbon dioxide will be removed from the atmosphere to eliminate any threat. While the objective of the 1992 UNFCCC treaty is sound, nearly 25 years of effort to find the means to accomplish the objective has failed. By sheer numbers and our natural desire to live better, humans have outgrown the ability to terrestrially extract the energy resources needed without threatening the Earth’s environment. The Paris Agreement’s path of relying on energy deprivation runs counter to how our world’s standard of living improves by using better technologies and supplying more energy per person. The only way out of this potential anthropogenic environmental crisis is to culturally grow out of the crisis. To accomplish this, per White’s Law, we must increase the supply of affordable energy per capita and, per the 1992 treaty, we must do this in a sustainable manner that does not threaten the environment. Only with space-based sustainable energy, built by a true human spacefaring civilization led by America, will we be able to accomplish this. The failure of the Paris Agreement was its failure to recognize this spacefaring future as the needed path forward for humanity. That the United States failed to propose this path forward is striking. Fortunately, this failure can be readily corrected through new American leadership.